Ok people, we’re in the homestretch of pumpkin week, so let’s go out with a bang. Here’s the scenario: you love pumpkin pie, but a pie isn’t enough to feed your crowd and pie crust is too obnoxious to fathom making more than one pie. 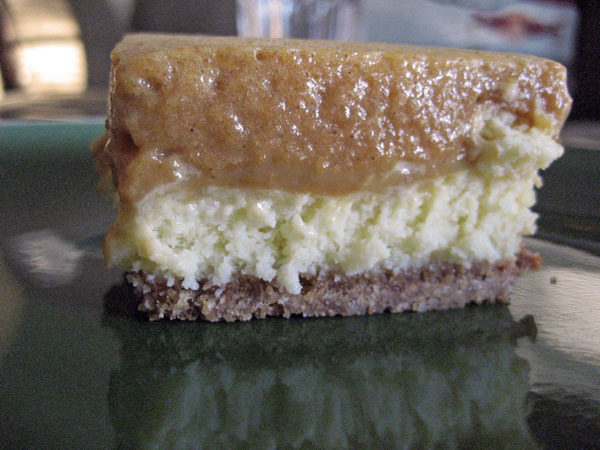 The solution: layered pumpkin squares. What do I mean by layered? I’m not talking layered like a green Pixar ogre, I’m talking graham cracker crust, cheesecake, pumpkin mousse, whipped cream. Layers of love my friends, layers of love. Redhead math fact: anything made in a 9×13 pan is infinitely easier than a pie crust. I standby that statement even though this recipe has four layers and requires the use of gelatin. Guess what? I’d never used gelatin before I made this – nailed it. Don’t be intimidated by the mousse layer. Mousse is your friend. Egg whites and gelatin make mousse happy. C’mon, make the mousse happy. And the whole double boiler trick – don’t be afraid, just don’t let the top bowl with the ingredients actually touch the boiling water below. Remember, we did this with the white chocolate brownies and those turned out delicious didn’t they? I made these bars for an office function and it was the first time I happily took the leftovers home because I wanted them to be MINE ALL MINE! Plus, I was in between my first and second half marathons at the time, so what harm could there be in eating them straight from the pan? How could I not – these bars are like pumpkin silk pie, like a pumpkin ice cream cake, like pumpkin pie parfait. If you make these once, you may be tempted to make these in lieu of pumpkin pie from here on out. Mix crumbs and sugar. Stir in melted butter; pat into 9×13 baking dish. Beat eggs, sugar and the cream cheese until light and fluffy. Pour over graham cracker crust. Bake at 350 degrees for approx. 25-30 min. (or until set). Beat pumpkin, egg yolks, ½ cup sugar, milk, salt and cinnamon in top of double boiler. Cook over boiling water, stirring frequently until thick, about 5 min. Put ¼ cup cold water into a small saucepan and sprinkle on the gelatin. Stir over low heat until dissolved; stir into pumpkin mixture. Cool. Beat egg whites until foamy. Gradually beat in ¼ cup sugar; beat until stiff and glossy. Gently fold beaten egg whites into pumpkin mixture. Pour over the cooled baked graham cracker mixture, refrigerate.